Check out fun facts and history, scoring rules, TV schedules, along with complete reports from the biennial 2018 Ryder Cup taking place this year from Friday, September 28 to Sunday, September 30, 2018. As a major golf event that occurs every two years, "the World Cup of Golf" pits Team USA against Team Europe in a heady mix of national pride and professional sportsmanship. On US television, watch for complete coverage of the 42nd Ryder Cup tournament beginning Friday, September 28 to Sunday, September 30, 2018 on NBC and the Golf Channel. Live streaming will also be available at RyderCup.com. Friday Sept. 28 Day 1 matches Golf Channel 2 a.m.-1 p.m.
Day 2 matches NBC 3 a.m.-1 p.m.
Sunday, Sept. 30 Final NBC 6 a.m.-1 p.m.
During the Ryder Cup matches, the pressure really mounts when individual players are required to let go of their media "star" status and work together to win. If one player is performing badly, the rest have to grin and bear it for the best possible outcome - namely, scoring a point for the team. Speaking of points, Ryder Cup rules adhere to a match play format that rewards the number of points a team wins, rather than the shots players take individually. In the end, it all adds up to victory if each team can really pull together. A match is worth one point and whichever team first accumulates 14½ points wins the Cup. 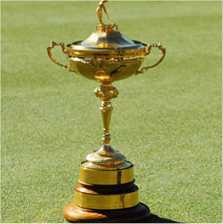 • The Ryder Cup trophy stands 17 inches tall, nine inches wide and weighs four pounds. The Ryder Cup is named after the English businessman Samuel Ryder who donated the trophy. • The very first Ryder Cup in 1927 was won by Team USA, on their home turf at Worcester Country Club in Massachusetts. • Throughout most of 20th century Ryder Cup history, American teams were predominant. Between the years of 1935 and 1985, Europe only won the Ryder Cup once. • There have been six-holes-in ones in Ryder Cup history, only one of these was by an American golfer, Scott Verplank, in 2006. • The oldest player to make an appearance in the Ryder Cup was Raymond Floyd, at 51 years of age in 1993. The youngest player was Sergio Garcia at 19 years of age, in 1999. Ryder Cup 2018 - Check out the official site for Ryder Cup updates, U.S. and European team stats and profiles, photos, video clips, and a complete travel guide with maps & directions. Ryder Cup - Find a good historical overview plus an explanation of the Ryder Cup format, notable or controversial matches throughout the years, Ryder Cup trivia, a complete list of winners from 1927 to the present, and related links, from Wikipedia. BBC Sports Academy - How does the Ryder Cup work? - The rules explained, with information on how teams are formed, the matchplay format including overviews of foursomes, fourballs, and team tactics.